But why was it called a spencer? We are told — and it may even be true — that the short jacket was named after the 2nd Earl Spencer (ancestor of Diana, Princess of Wales). On one occasion, he is said to have stood too close to the fire and burned the tails of his coat. (Did drink have anything to do with that, I wonder? Who can say?) 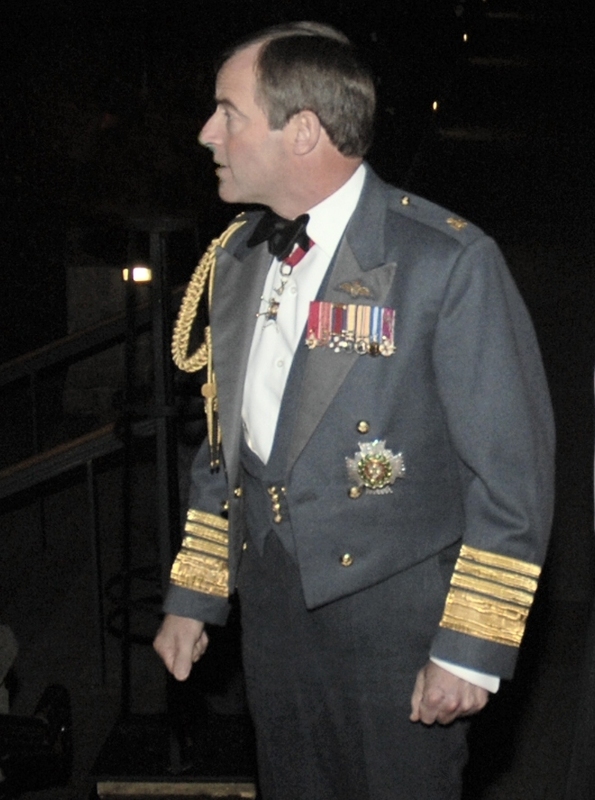 So the earl commissioned a tail-less coat which wouldn’t catch fire and it was — of course — named after him. The “spencer” was born. Regency ladies weren’t the only ones to adopt it. 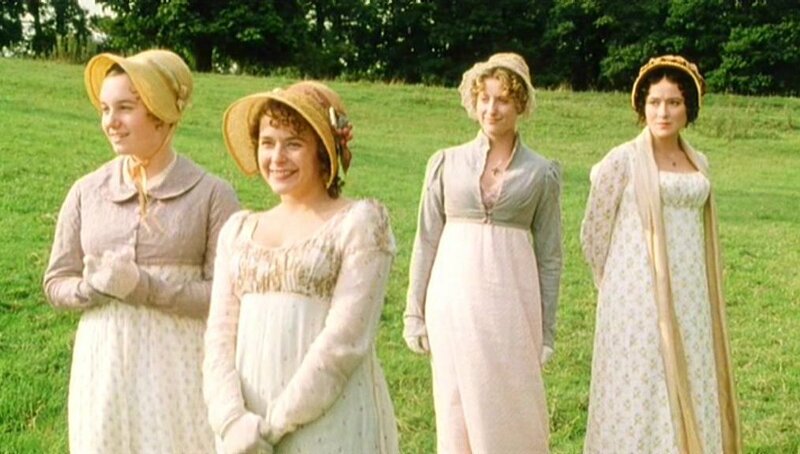 The other thing to note from the BBC’s Pride & Prejudice picture is the accessories to be worn with a spencer. It’s clearly a beautiful day; the sun is shining, and it’s probably warm. But to go outside, even Lydia wears a bonnet and, crucially, gloves. It would have been a real faux pas for a gentlewoman to have forgotten her gloves. When was a spencer worn? A spencer was for both indoor and outdoor wear, and for day or evening. It was a multi-purpose garment, clearly, and very practical. 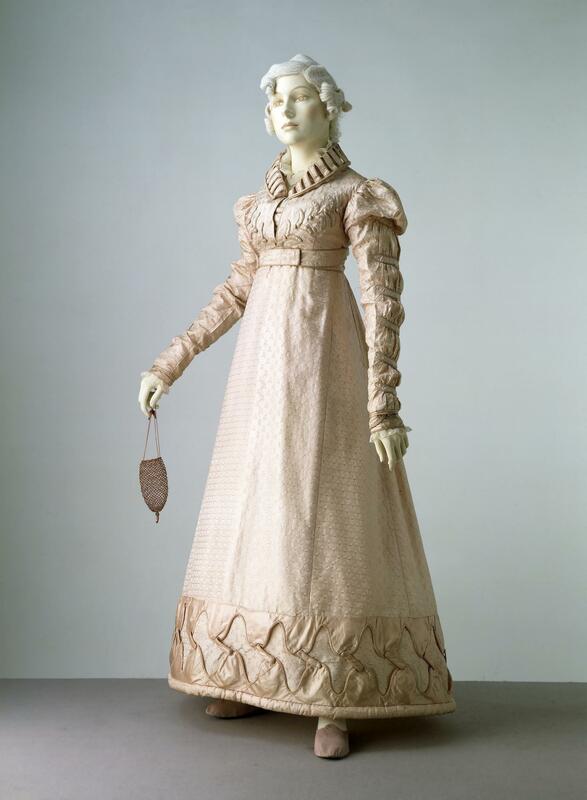 It could be made of everyday material, like Mary Bennet’s, or something more luxurious, like the one below (from the Hereford collection) of figured cream satin with ruched pink decoration. 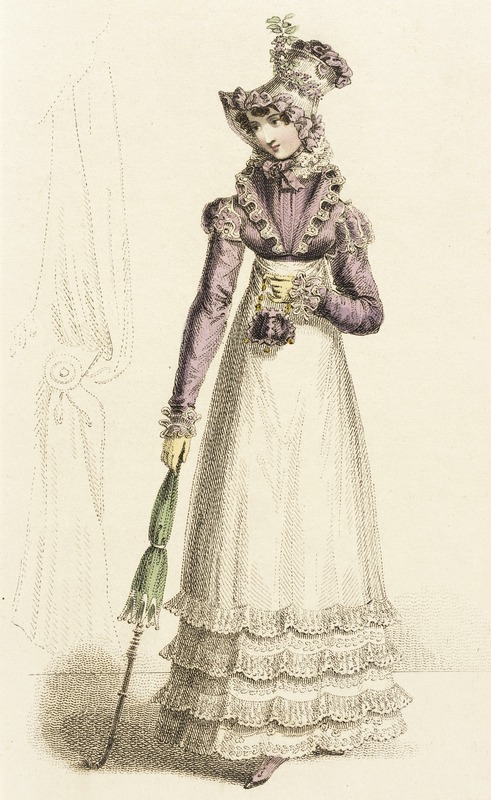 Since Regency day gowns were often of white or very pale colours, contrasting colours were common for spencers. Both dark blue and black were favourites. This one (also from the Hereford collection) is dark grey, decorated with metal buttons. 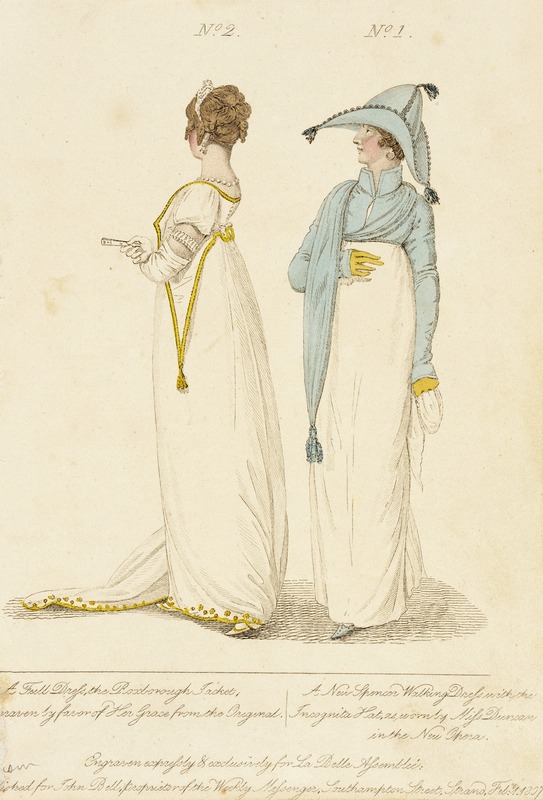 Their popularity is shown by how often they appeared in fashion plates in the ladies’ magazines. The examples shown below, from the LACMA collection, date (left to right) from 1807, 1812, 1817 and 1820. So a spencer was a simple jacket? The jacket may have started simple, like Mary Bennet’s. The pattern was basically the same as the bodice of the high-waisted Regency gown, but cut a little larger so as to fit over the dress underneath. 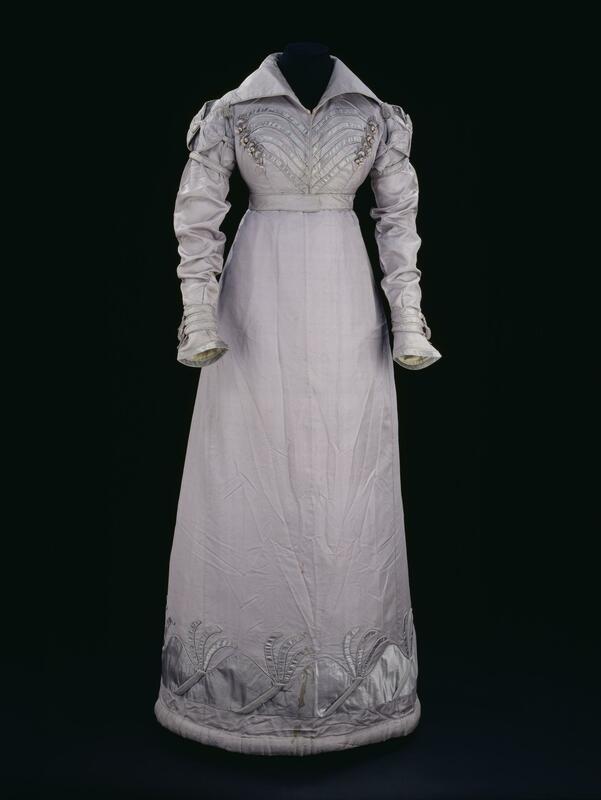 However, as the simple gowns of the early nineteenth century became more ornate, so did the spencers, as you can see from the four fashion plates above. Seen from a distance, this spencer is deceptively simple but it would not have been cheap. 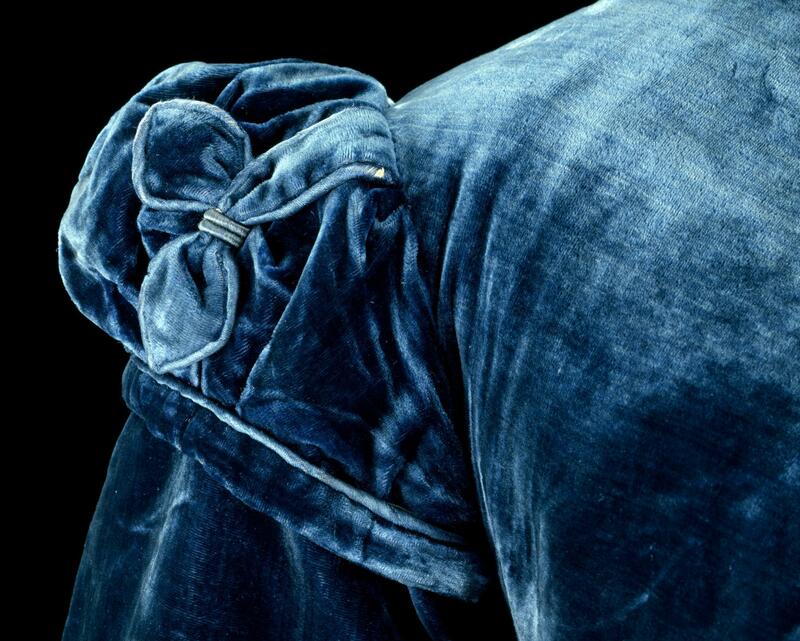 It dates from 1818 and is made of luxurious dark blue velvet, faced with satin. The rounded collar is stiffened so that it can be worn turned up — very flattering, especially with the right hat. The jacket fastens edge to edge with a metal hook and eye at the neck. 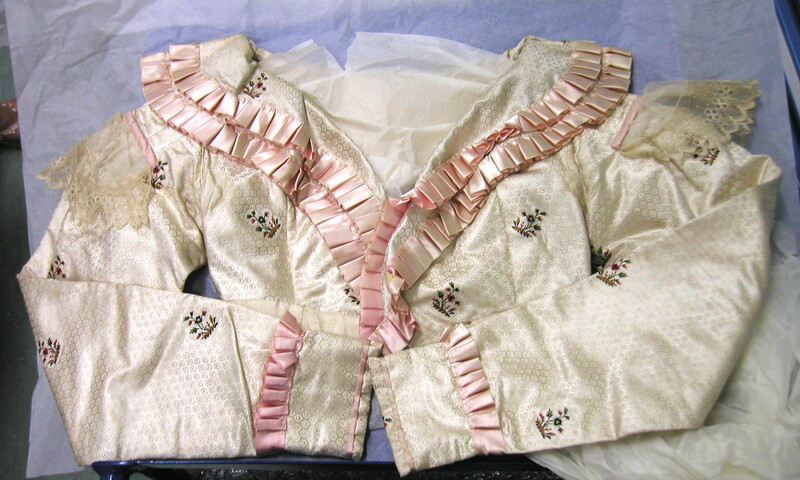 (Hook-and-eye fastenings were relatively new.) 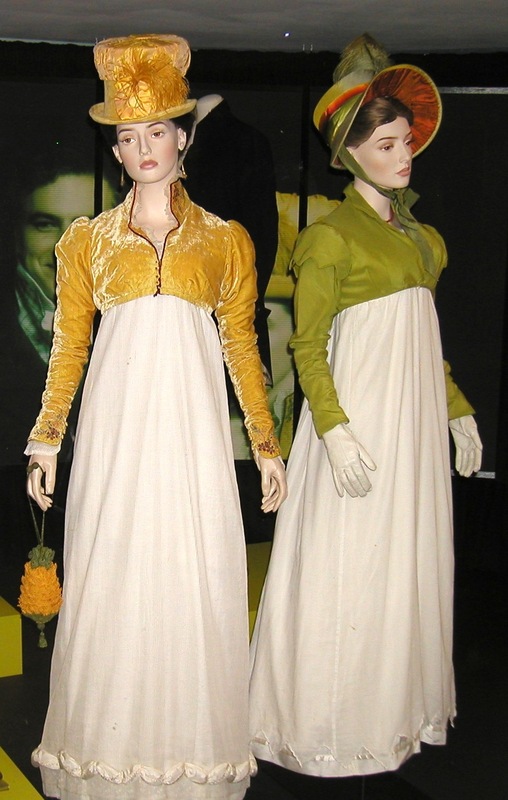 The style of both dress and spencer is incredibly high-waisted, as was the fashion in 1815-1820. It looks pretty uncomfortable to me. The seamstress’s clever fingers have been at work again. Look at the gorgeous detail at the shoulder, with all that hand-stitched piping. The early nineteenth century was the period of the Napoleonic Wars too, and so military styles — all those dashing and highly decorated uniforms — influenced female fashions, especially in the years after Waterloo. 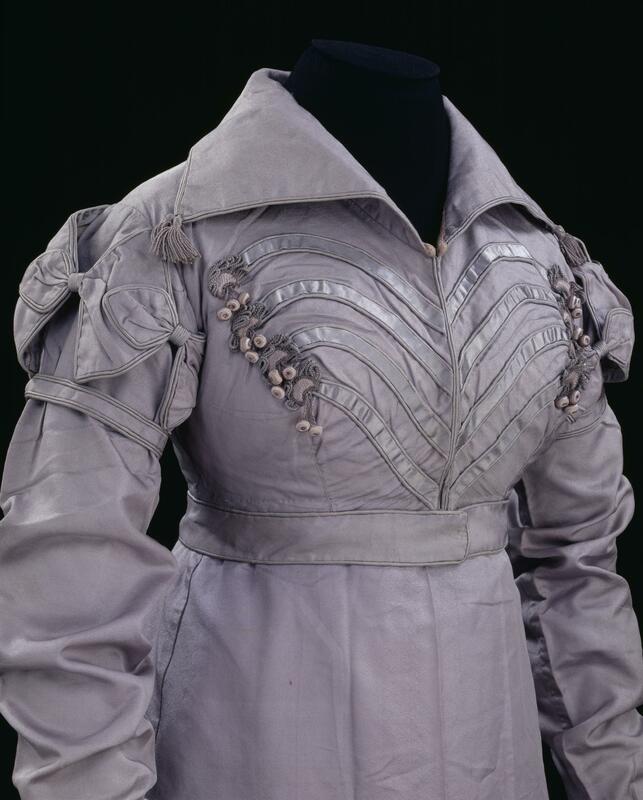 This silk and satin spencer and matching walking dress dates from 1817-1820 and has a distinctly military look. Tassels, fringing and braid (passementerie) were definitely in fashion. This spencer has all the military hallmarks if you look closely. 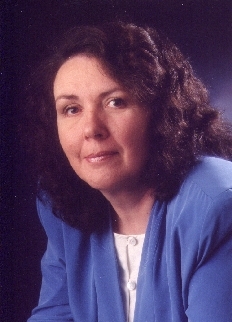 (Click on the picture for a larger view.) Tassels on the corners of the collar, braid and pendant balls on the satin decoration of the bodice, all softened by feminine bows on the epaulette-style upper sleeves. How many hours of stitching? I can’t imagine, but the skill is amazing. The spencer was dependent on the high-waisted style. So when waists returned to their normal position, spencers disappeared. 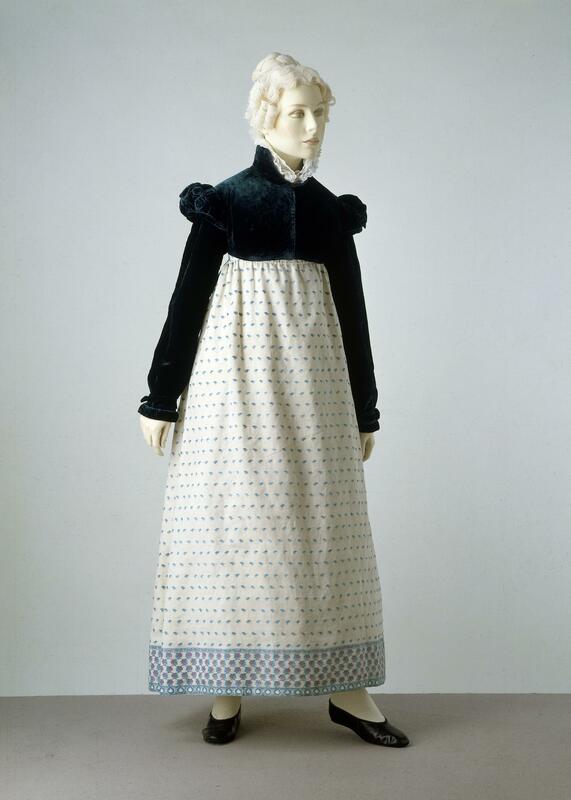 We often assume the “Regency style” ended around 1820 when the Prince Regent became George IV, but the high-waisted style lasted for several years, as you can see from this 1823 walking gown and matching spencer. But spencers didn’t help when it was cold? 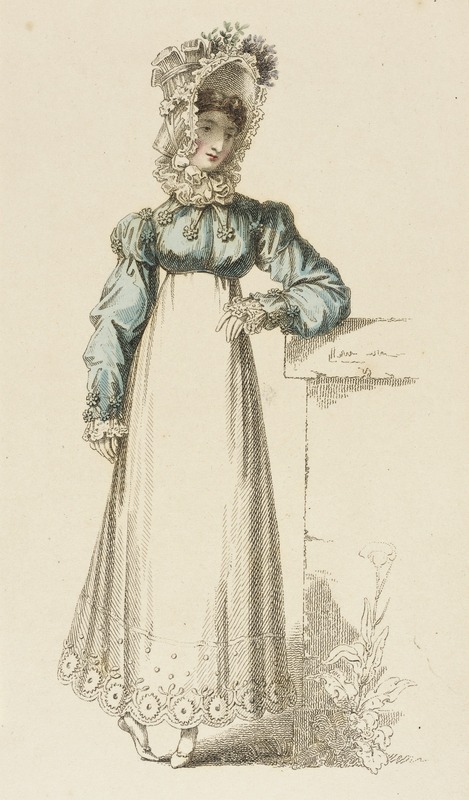 Returning to my original question: what to wear over those skimpy Regency muslins to stop a poor girl from freezing in the wind or the cold? Wearing a spencer gave a little extra layering for the area from the bustline up. But what about the rest of the body? Sensible women might have worn extra petticoats, perhaps even flannel. 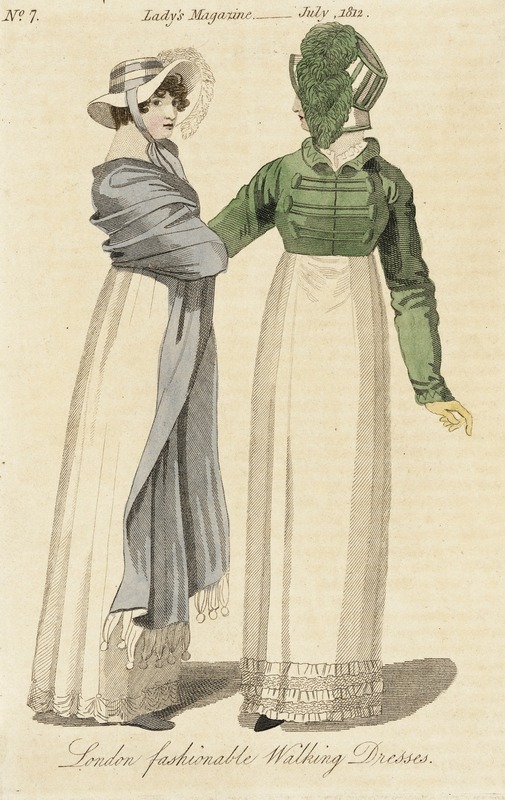 But the really sensible — and fashionable — gentlewoman might have ditched her spencer, in favour of a full-length pelisse. Thank you for this wonderful addition to my understanding. I like the look, would have hated to wear one, and why wear a “wrap” that doesn’t warm one? Morning, Sue. Glad you liked it. You ask a good question about warming but I suppose that, through the ages, women (and men) have worn really uncomfortable and impractical clothes just because they were the fashion. I think, for example, of all those high-heeled pointed-toed shoes that I used to wear… Didn’t do my poor feet any good at all. Excellent post. Spookily this morning, putting a fleece on for my morning walk, but leaving my legs in shorts, I was thinking that a spencer would probably have worked the same way. As long as my top half is warm, the rest of me can cope. Stout shoes would help of course.